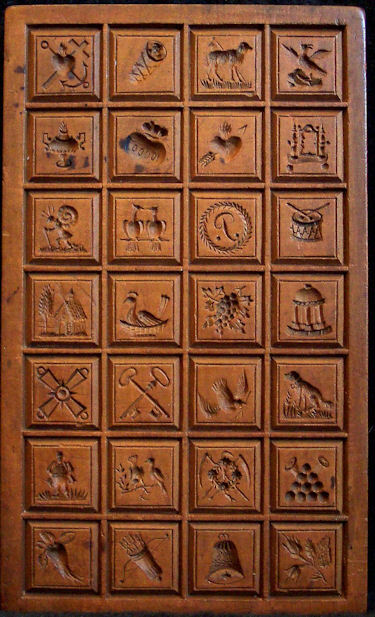 This mold appears to be from around the early to mid 1800's and measures 12" x 8 1/2" x 1" and contains 49 different images. This board is referred to as the Adventurer and I believe this is because it looks to represent the travels of a Ships Captain. On this board there looks to be his family crest and the ship which he commanded. The camel and lion suggest that he visited parts of the African continent. The men with the weapons on this board perhaps represented the military and hunters that went along with him. The man smoking the long pipe and carrying the staff surely was a guide and interpreter. The priest along for spiritual guidance and to make notes for the church as well as to establish religious footholds in the countries they visited. The native could represent the might that this traveling group met up against or just a native of the lands that found these travelers as interesting as they found him. The women could be the loved ones the Captain left behind and the house you see is where they lived along with the Captains infant child. The Captain loved his family very much as the flowering heart represents. The wild game, fish, and fowl as well as the bounty of fruits and the bee hive tell of an abundance on his grounds. It must have been a great home for he and his family and a carefree one as the squirrel represents. The caged bird? Possibly a rarity brought back for his dear wife or a representation of the caged and separated life he led when on the seas. The Adventurer - To see a larger picture in a new window click on the image, when new window has opened click on image again if it is not larger. Close new window to return to original site. 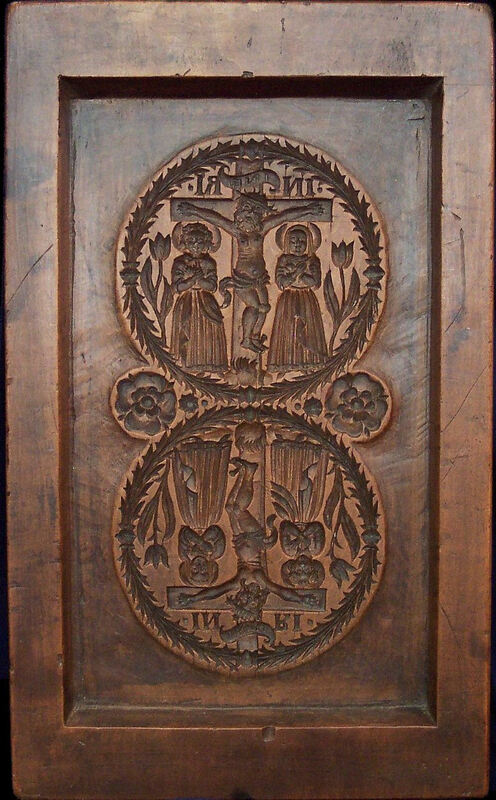 This mold measures 9 3/8” x 5 1/2” x 1” and is carved on both sides. 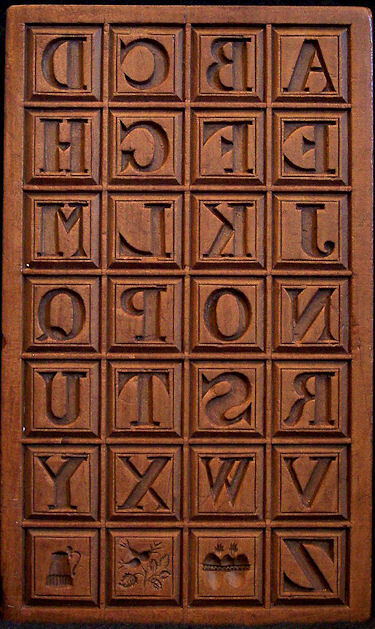 This board is referred to as an alphabet board. These were typically given to young school age children to help them with learning their letters. On one side you will find the alphabet and on the other you will see 28 different picture images each within its own frame. All of the individual pictures measure 1” x 1” and all of the images are very detailed and beautifully carved. Feathers, fur, hair, eyes and buttons can all be seen with detail. One of the most interesting images to me is of a snail hiking. The original owners signature, Margarete Simader, is still on this board. The board dates to the 1800's. This board dates to around 1811 and measures about 10 3/4” x 4” x 7/8”. The eight individual scenes measure about 2.25” x 1 .75” each. There are 4 different borders for these detailed framed pictures that depict the Life of Christ. It looks to be made from a piece of fruit wood and has mellowed beautifully with age. 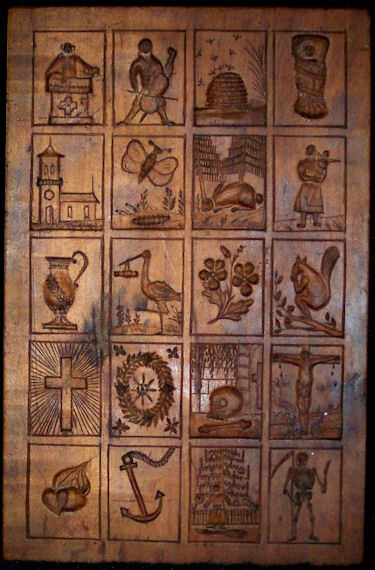 This board with its unique motifs measures about 8 3/8” x 5 1/2” x 7/8” and carries a stamped "S" in a circle on it. The board dates to about 1849. 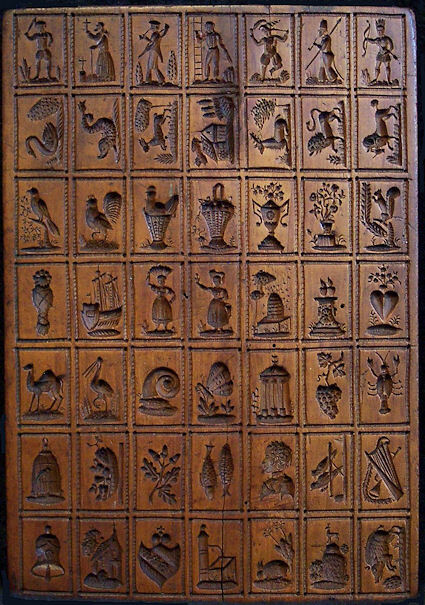 There are a few motifs I have not seen on a board before. Those being the Skeleton Reaper, the Skull beside the crypt and the Preacher at the pulpit. 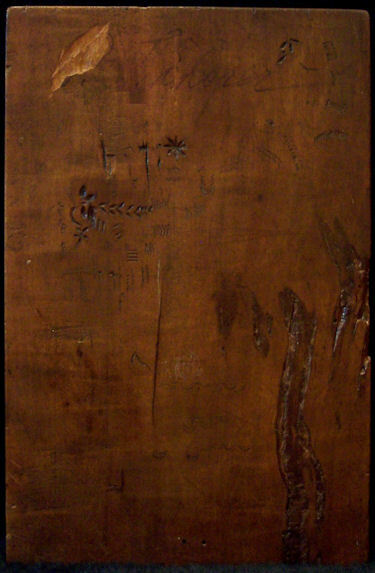 Visible on the back of this board are the practice marks the carver made. The title of this board is S mold. 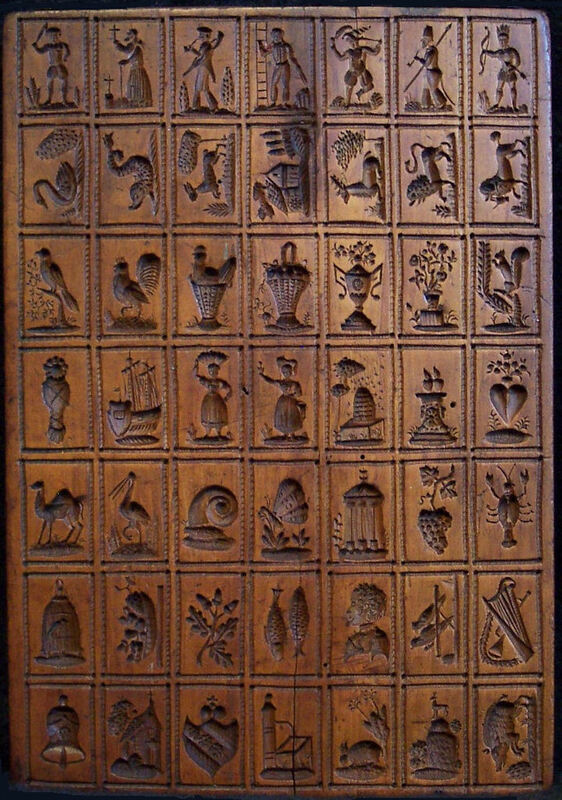 This mold which is referred to as the "FAW" mold is from Ulm Germany and had resided in a private collection. It now resides in the Sara B. Carlisle Collection. It measures 16 3/4" x 10" x 2 1/4" and carries the initials FAW. The wood is heavy and dense with a very warm rich patina. Due to its size, I believe it to be a Lebkuchen mold. 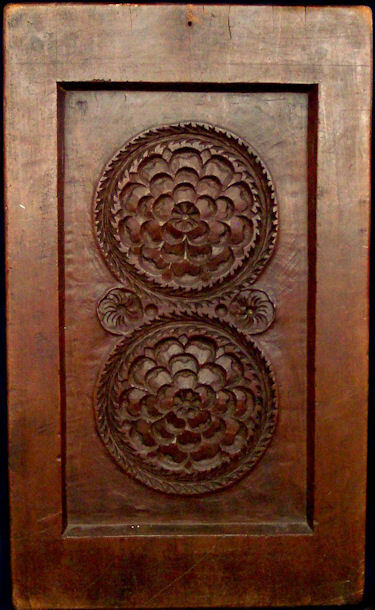 Estimated to be from around 1720, this is the work of a master carver. On one side you see an almost mirrored image of Christ on the cross and the other side, flowers. The carver certainly paid attention to details.